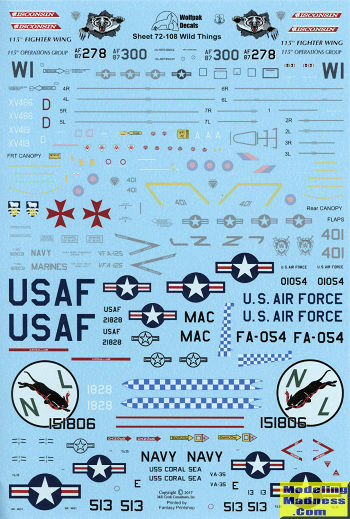 This sheet provides seven different markings options. Most of them are what I'd call 'modern' era, though I guess it depends on when you were born! The first two options are for 176 FS, Wisconsin ANG aircraft from mid 2016. Both are 'boiss birds with one being for the 115th OG and the other for the115 FW. The wing bird has a special tail marking instead of codes. Next, a pair of FGR.2 Phantoms based in the Falklands in 1991. These planese are named 'Desperation' (with the white fin), and 'Charity'. They are with 1435 Flight, which consisted of, I believe, four aircraft. It was the need to deploy planes to the Falklands after the 1982 war with Argentina that caused the RAF to buy refurbished F-4Js from US stocks for 74 Squadron. The F-35C is one assigned to VFA-125, the training squadron based at LeMoore, CA in Feb of this year. 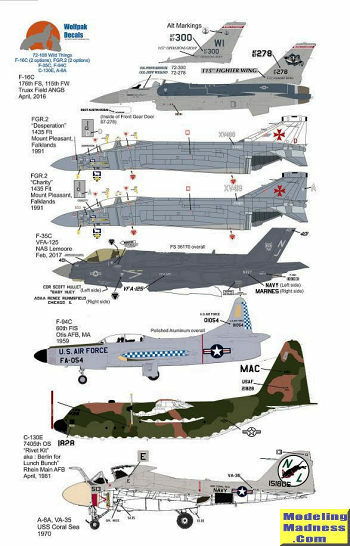 The real oldie on this sheet is an F-94C with the 60th FIS based at Otis AFB in 1959. Finally, An A6A from VA-35 based on the USS Coral Sea in 1970.